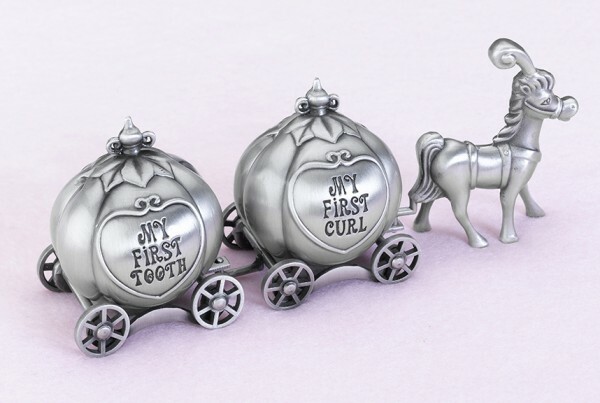 This silver pewter tooth and curl set includes two carriage boxes and a lead horse. One carriage pumpkin is engraved with the words MY FIRST TOOTH and the other with MY FIRST CURL. Both pumpkins sit unattached atop their wheel base. A hinge at the bottom of each pumpkin allows them to be opened and closed. The insides are lined with blue velvet. Although the three pieces that make up this set are not connected, they do hook together (as pictured).